This article is 3246 days old. The following is a guest article by Natalie Green. Beautiful weather and dedicated volunteers contributed to a very successful clean-up event on Saturday, May 29, 2010! Thanks are owed to the 13 volunteers that offered their time to clean-up a portion of a drain that leads to the Detroit River adjacent to Broadway Avenue and Black Oak Heritage Park in Windsor. 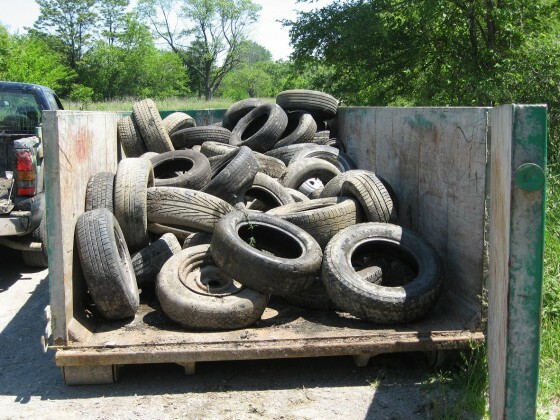 The volunteers collected 105 discarded tires and two full dumpsters of garbage including two television sets, a couch and loveseat, a boat hull, exercise equipment, fluorescent light bulbs, construction materials and a lot of other debris. The public is reminded not to dump illegally in drains or empty woodlots. For information about how to dispose of household waste such as used tires, contact the Essex-Windsor Solid Waste Authority (www.ewswa.org). The protection and enhancement of our Detroit River and its watershed through environmental efforts such as cleanups help enhance the quality of life for residents, makes the region more attractive to visitors and ensures a sustainable natural legacy for future generations. The event was sponsored by Detroit River Canadian Cleanup (DRCC), City of Windsor, Essex Region Conservation Authority and Windsor Port Authority. The DRCC is a community-based partnership between government, industry, municipalities, environmental organizations, and citizens working together to improve the Detroit River Area of Concern identified in the Canada-U.S. Great Lakes Water Quality Agreement. For more information, please visit www.detroitriver.ca. Thanks Natalie for the article!